For more than 30 years, Trimble has been developing GNSS that advance the capabilities of the surveyor, enabling efficient and accurate data capture in the field. The Trimble R10 is no exception. With powerful technologies that go beyond comprehensive GNSS support, the Trimble R10 enables the surveyor to collect more reliable data no matter what the job … and sometimes in the face of adversity. 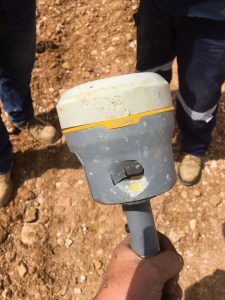 For Trimble R10 GNSS 5614XXXXXX (serial number withheld to protect its real identity) life has not been easy. Supplied to a survey company in Australia by UPG (Ultimate Positioning Group) in mid-2016, ‘she’ was immediately put to work, performing feature surveys, helping with control networks on several large energy infrastructure projects and saving its owners plenty of time in the field. In mid-2017 though, things took a tragic turn when 5614XXXXXX, or Kit 4 as she was affectionately known around the office, went missing, stolen from a company vehicle under the cover of darkness. Search parties were sent out and tears were shed. UPG was contacted and a loaner immediately supplied. But things were not quite the same. Kit 4 was a valued member of the team and was sorely missed. But a miracle came! Soon after her disappearance there was a buzz about the office when a call came in that one of the surveyors had spotted a yellow Pelican case bobbing about in a nearby lake. Kit 4 had been found. Her case had some water inside it, but otherwise she was in perfect working condition. A little wipe down to remove some lake sediment and slime and a quick benchmark test to prove her accuracy and then Kit 4 was sent to UPG for a once over. After passing with flying colours, Kit 4 was back in the field. Some more engineering work was on the cards and it was a busy winter and spring for her with many surveys to complete. But an R10’s life is not that easy sometimes. In November Kit 4 was deployed to a construction site and entrusted into the care of a contractor. In what can only be described as a catastrophe for positional avoidance, Kit 4 was again in the thick of things when a grader caught Kit 4 unaware and she was mowed down. But the show must go on. The day’s work had to be done and thankfully, despite her near-death experience, Kit 4 was still in operational condition and a quick benchmark check gave everyone the confidence required for her to carry on. At the time of writing, Trimble R10 GNSS Kit 4 is still working hard in field. She will be sent to UPG soon for some minor cosmetic work to repair the damage caused by the grader. The service technicians reckon it will buff right out and she’ll be back in the field in no time at all. From all of us at UPG, we wish Kit 4 well … but after all, this is the level of service that our customers have come to expect from Trimble and UPG over the years.